This strange packet trick from Paul Diamond's Magic Co, circa 1980's, is very reminiscent of the great Tenyo Wild Wallet effect. It is not as good as Wild Wallet, but it also doesn't command prices over $100 when you find it for sale, and you will actually be able to show it to audiences, rather than keep it pristine in your Tenyo collection display cabinet. The effect is a simplified version of the Wild wallet trick: you show a small vinyl wallet and remove four cards from it. Three of them have animals on them, and one is an empty cage. The spectators choose one animal -- the lion -- and so the lion card and empty cage are placed in the wallet. 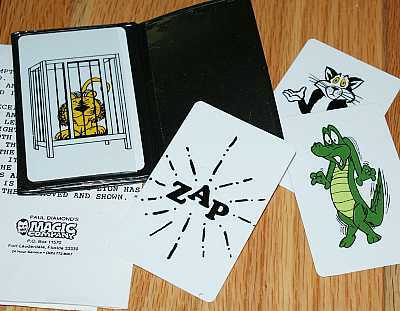 When the wallet is opened, the lion has vanished from the card ("ZAP"), and he is now inside the cage. For those familiar with the Tenyo Wild Wallet, this trick's method is not as ingenious. But to laypeople (especially kids) the effect is exactly the same, and the magical impression is just as strong. For those who have never seen Wild wallet, you will just think it is a good commercial trick. The cards are printed on thick plastic, and will last forever, even if you use this for your table hopping gigs. The gimmicked wallet is decent quality and works fine, but you may wish to replace it with a better quality version of this popular gimmicked wallet.